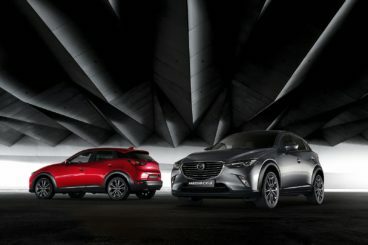 The new Mazda CX3 Hatchback is a stylish alternative in the already impressive Crossover market. It’s got an upmarket interior, sharp looks, and it’s good fun to drive. It’s like a conventional Hatchback but super-sized, and offers plenty of room for growing families. Compared to rivals, the CX3 is a bit on the expensive side. However, Mazda can feel justified with their pricing when you take a look at the list of standard kit: The likes of a 7” touchscreen, alloys and cruise control all comes with the entry level model. It’s reasonably practical too, its 350-litre boot out-sizing some competitors. OSV takes a closer look at what it’s all about with our Mazda CX3 Hatchback review. 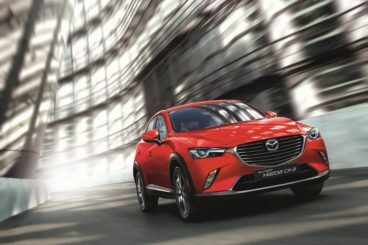 On the road, the new CX3 drives well, helped in no small part by Mazda’s recent weight-saving measures. It feels a lot like a conventional, smaller Hatchback, rather than a big and brawny SUV. The well-weighted steering and light gearbox are pleasing, while body control is good. All in all it feels a lot more than you might expect. In terms of the engines, there are only two available – one diesel and one petrol. The choice is limited, but both are quiet and settled. You’ll barely hear a peep out of them, even on the motorway. The 1.5-litre SKYACTIV diesel engine opens the range. It will be the number one choice for anyone who wishes to keep fuel costs and emissions as low as possible. It’s refined and smooth, too, and doesn’t make much noise when idle. However, once you really put your foot down, it gets a bit cranky. Lower down the rev range, you’ll notice that it’s a bit hesitant. But once you get up to speed, its power becomes stronger and more consistent. It can do 0-62 in 10.1 seconds and maxes out at 110mph. These are impressive numbers, especially when combined with its fuel economy. The 2.0-litre petrol engine is your other choice. It comes in either 118 or 148bhp guise, with the former doing 0-62 in 9.0 seconds. The latter covers the same distance in 8.7 seconds, which is more than enough pace for a car like this. Both petrol engines need to be worked hard, and both sound strained once you put your foot down. On the plus side, they’re more responsive than the diesel. We like the 118bhp version. It’s not as affordable to run as the diesel, but it emits only 136g/km of CO2. That’s decent, and it’s got a good amount of power in its reserve to keep you satisfied. We think buyers will be more than satisfied with the interior. It’s very upmarket, with soft-touch plastics, top-grade materials as well as contrasting colours helping it to stand out. Most rivals sport rather bland and grey interiors, so it’s nice to see Mazda buck the trend with a much more colourful and lively cabin. Fit and finish is easily among the best in class, too. However, there are still some harder plastics here and there which will scratch. Mazda has added a new 7” touchscreen for 2017, and it frees up the dashboard from button clutter. You use it to control the likes of the infotainment system and sat nav via a centre console rotary dial. Most of the dials are well-placed and easy to find and use, though one or two are more remote. Tip: Look next to your right knee, as there are some hidden down there (we’re not sure why). Some of the controls are genuinely classy, even if they are hidden. For example, the stereo and air vent controls come with a slick knurled metal finish that reminds us of an Audi. The Mazda CX3 Hatchback is practical, but it doesn’t excel in this area. It’s got a good amount of interior space for a small family, and is easy enough to get in and out of. The seats are supportive, while the driver also gets a high driving position. Combined with the reach and rake adjustable steering wheel, it makes visibility good. Storage spaces include a sizeable glovebox, a few good-sized door bin’s, and a couple of cupholders. Legroom is good throughout, but taller passengers will struggle with the sloping roofline. The boot measures 350-litres, which makes it one of the biggest in this class. Fold the rear seats and you can extend it to 1,260-litres. It’s well shaped, and comes with a false floor. However, it does have a high opening. Standard kit is good, and one of the reasons why the list price is high. Entry level SE models get a leather steering wheel, air conditioning, cruise control and a DAB radio as standard. They miss out on sat nav, though, which isn’t added until the Nav trim. The range-topping Sport-Nav is super plush, and gets the likes of a heads-up display and keyless entry. It also comes with heated seats and a Bose stereo. The Mazda CX3’s standard safety kit is good, too. Included are six airbag’s, an emergency stop signalling feature, hill-hold assistance and electronic stability control. However, the mid-range SE-L trim adds an autonomous emergency braking system, and lane-departure warning – both which we feel should be standard across the range. Prices for the new car start out from £17,900 and rise to £24,500. If you prefer to lease, you can pick up a deal from around £222 + VAT per month. For more information on our leasing deals, check out our page here. In terms of its running costs, Mazda has worked hard to keep the CX3 Hatchback as light as possible. Coupled with the brand’s efficient SKYACTIV technology, it’s resulted in some good numbers. The 1.5-litre diesel is the cheapest to run, with returns of 70.6mpg and emissions of 105g/km of CO2. This is with two-wheel-drive and a manual gearbox. Add four-wheel-drive and an automatic, and economy drops sharply to 54.3mpg. The 2.0-litre petrol engine is available in two guises, with the 118bhp front-wheel-drive variant able to return 47.9mpg. The bigger 148bhp model returns 44.1mpg at best. There is a real top-quality feel to the CX3, helped by its smart looks and interior. Only two engines are available, but both the diesel and petrol models are performative and efficient. Mazda is good at producing entertaining rides, and this one is no different. It’s a terrific way for growing families to spend time on the road. At speed, the engines – especially the diesel – pipe up. Rear seat space is cramped, and taller adults will feel the pinch on longer journeys. Let’s see how the car fares against its rivals in the comparison section of our Mazda CX-3 Hatchback review. 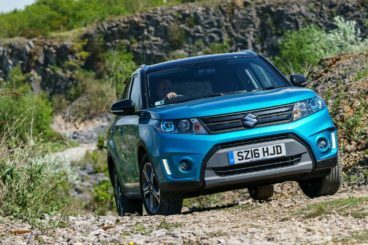 The new Suzuki Vitara is back – but not quite as we know it. In 2017, it’s so much better than last time. Sharper looks, sportier engines and more equipment is the order of the day. The engine range is actually quite small, and there are just three to choose from. But Suzuki – and OSV – would argue that it’s what you do with them that matters. They’re all performative, with the turbocharged 1.6-litre petrol engine perhaps the only one we’d overlook. It delivers up to 118bhp, and does huff and puff on a full load. Much better is the 1.4-litre turbocharged petrol engine. It produces 138bhp, and with its power distributed more evenly across its rev range, it’s a much better rival to the Mazda. It does 0-62 in 10.2 seconds, which isn’t half bad. And despite four-wheel-drive being mandatory, it’s more efficient than the two-wheel-drive 1.6-litre petrol model. The sole diesel is sized 1.6-litres, and does 0-62 in a more modest 11.5 seconds. However, it feels faster than that and is compliant enough so that you don’t have to work it too hard. It’s quiet-ish for a Suzuki – but that’s not saying a lot. However, in two-wheel-drive and wedded to a manual ‘box, it can claim to be the most frugal engine in the range. Suzuki say it will return 70.6mpg, but we think you’ll be averaging 60mpg while emitting 106g/km of CO2. The petrols, when combined with four-wheel-drive, can return around 50mpg at best. Inside, Suzuki has made big strides in terms of interior quality. However, while it wears its Sunday best, it’s a bit frayed around the edges. In other words, there are some nice touches, but there is still evidence of cheaper plastics. Soft-touch plastics live side by side with scratchier surfaces. The cabin is comfortable and relatively quiet, although diesel clatter is an issue. The dashboard is logically arranged, and we love the big analogue clock – although the entry level models miss out on this. It also misses out on a 7” touchscreen. It’s practical to a degree. Light doors are family-friendly, the driving position is good, as is ride height. Its size is an issue – as it is with the Mazda – and the Suzuki Vitara isn’t the easiest car to park. Head and legroom are decent but not class-leading, while the boot measures 375-litres. Fold the rear seats and you can increase that to 1,160-litres. The new Kia Sportage looks like a cute city car that one day woke up as a compact SUV. So has it got the steel and space to give you what you need? Impressively, yes. But let’s start with its driving experience, which blends fun with comfort to a tee. It’s not entertaining, but it’s more than competent. Its steering is direct and always positive, and the ride quality is good. Importantly, there is also a lot of grip. Opening the diesel range is a 1.7-litre 114bhp unit that’s been around for a while. It’s paired up with a 6-speed manual, and does 0-62 in 11.1 seconds. We prefer the 2.0-litre 182bhp diesel, though. It gets four-wheel-drive as standard, is flexible and refined, and does 0-62 in 9.2 seconds regardless of whether you stick to the 6-speed manual transmission or go for the 6-speed automatic. There is also a 134bhp version of the same engine, which does 0-62 in 10.1 seconds with the manual ‘box. A couple of petrol engines are also available, but are unlikely to sell well. A turbocharged 1.6-litre power plant is impressive, quiet and smooth. It’s fast too, and covers the 0-62 dash in less than 9.0 seconds. It’s their economy that really harms the petrol engines, though, with the sole non-turbocharged model returning 44.8mpg at best. That won’t make viable financial sense to most buyers, who will surely be more attracted to the two-wheel-drive 1.7-litre diesel’s returns of 61mpg. Or the 2.0-litre 134bhp diesel, which can return 54mpg. It’s worth mentioning that adding the 6-speed automatic transmission will bump up costs – but it isn’t available on entry level models. Inside, the Kia Sportage is a bit boring, but the quality is high. The seats are comfortable, there is a good amount of standard kit, and the layout is logical. It all feels so well put together too, and all models get a new touchscreen that’s responsive and simple to use. Practicality is good. 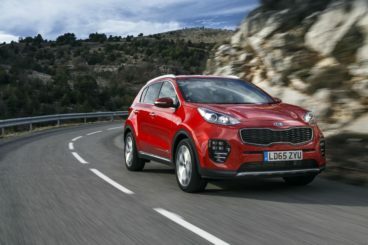 The Kia Sportage is bigger than last time, and Kia has used the increase well. There is more interior room, and the boot has been extended to 503-litres. Storage spaces are everywhere, and four passengers will have plenty of head and legroom. The compact crossover market is already well stocked, and this is yet another solid addition. We’re just not sure how you’re going to make your mind up. But perhaps an upmarket feel, top notch engines and sharp handling can help? If so, the new Mazda CX-3 Hatchback ticks plenty of boxes.